I have been trying to install this version of Android Studio for last 8 days. Tried installing it with both Oracle Java 1.8 and Open JDK 7 (No Luck!!). I have also tried downloading different versions of Android Studio (All Stable). 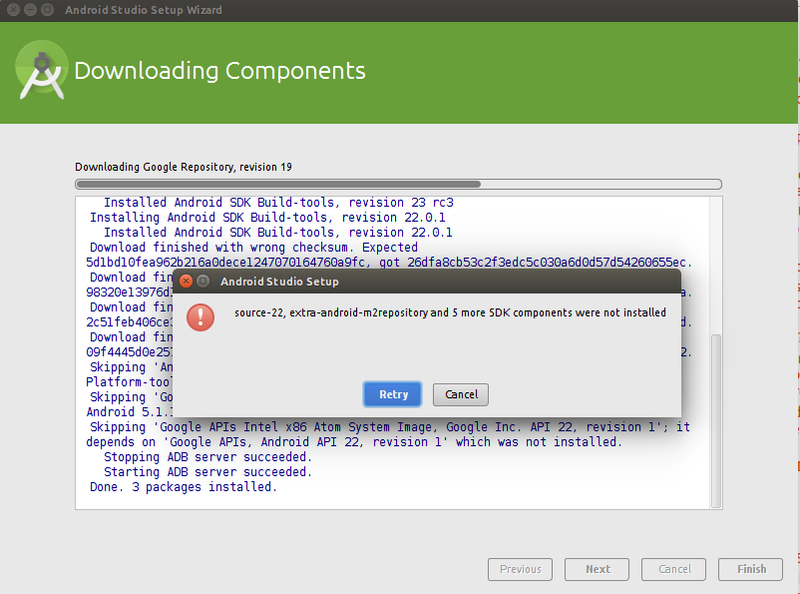 Installing Android SDK Platform-tools, revision 22 Stopping ADB server failed (code -1). Download finished with wrong checksum. Expected 5d1bd10fea962b216a0dece1247070164760a9fc, got 26dfa8cb53c2f3edc5c030a6d0d57d54260655ec. Download finished with wrong checksum. Expected 98320e13976d11597a4a730a8d203ac9a03ed5a6, got 3fe8cef65eb94f20c422ab7d869092786d368eaa. Download finished with wrong checksum.Expected2c51feb406ce3c7e09db8339a0d680beb91b8bf1, got 0f0a3829ff1ca54a0f3b06d48de7ca8358f2994d. Download finished with wrong checksum. Expected 09f4445d0e2572e514de60615bc0cc3a7d391558, got f463224a18eb3892f15bd5e483e5e725db6d9502. Skipping 'Android SDK Tools, revision 24.3.3'; it depends on 'Android SDK Platform-tools, revision 23 rc4' which was not installed. Skipping 'Google APIs, Android API 22, revision 1'; it depends on 'SDK Platform Android 5.1.1, API 22, revision 2' which was not installed. Skipping 'Google APIs Intel x86 Atom System Image, Google Inc. API 22, revision 1'; it depends on 'Google APIs, Android API 22, revision 1' which was not installed. Now please tell me what is the issue going on here, I though trying to download it via wget, flareget or some other download manager, but that too did not work. Any help would be highly appreciated, I just want to this to setup perfectly than I will start programming again. Thanks in advance!! are you trying to install it from within china? If yes then you might have a issue with the connection to google. Post post describes the same issue and was fixed by using a vpn. A proxy server would probably work too. Try ubuntu make. It worked on my machine without any problems. This article in the ubuntu wiki describes how to install ubuntu make and then android studio. Not the answer you're looking for? Browse other questions tagged 14.04 android-studio or ask your own question. New Android Studio IDE not supported in Linux?